Home | Our Buds | Alexander Springs, Ocala Nat'l Forest | Big Lagoon State Park, Pensacola, FL JANIE'S HOMETOWN | Blue Springs State Park, Orange City, FL | Buck Lake, Ocala Nat'l Forest | Chassahowitzka River, Homossasa Springs, FL | E.G. Simmons Park, Tampa Bay, FL - DAVE'S HOMETOWN | Farles Lake, Ocala Nat'l Forest | Hillsborough River State Park, Zephyrhills, FL | Ichetucknee River, Ft. White, Florida | Juniper Springs Camp Trip | Juniper Springs Canoe Run | Juniper Springs Nature Trail | Juniper Springs Florida | Lake Dorr, Ocala Nat'l Forest | Manatee Springs S.P., Levy County, Fla. | O'Leno State Park, High Springs, FL | Rainbow River, Dunnellon, FL | Rock Springs, Apopka, FL | Sebastian Inlet State Recreation Area, Melbourne Beach, FL | Silver River State Park, Ocala, FL | Tomoka State Park, Ormond Beach, FL | Trimble Park, Tangerine, Orange Co, FL | Trout Lake, Eustis, FL | Withlacoochee River, Inverness, FL | Camping in 1926 with Indians | Related Links | Scammed by my own HVAC repair company! 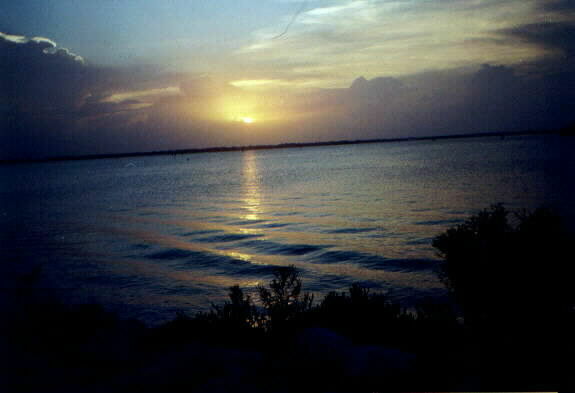 This park is on the east Atlantic coast of Southern Central Florida. My sister lives in nearby Vero Beach so it was a wonderful opportunity to get together, camp and boat together. 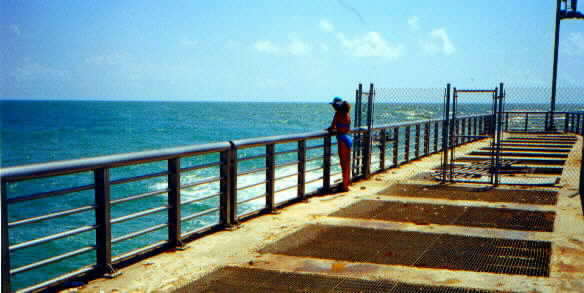 Sebastian Inlet is located on A1A 15 miles south of Melbourne Beach. It is on a barrier island divided by the man-made inlet. 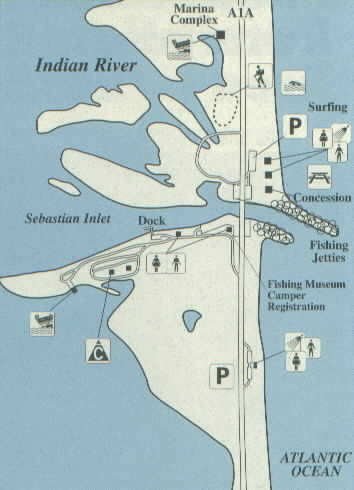 It has waterfront on the Indian River, the inlet and two jetties and a very nice park on the Atlantic Ocean. Fishing is excellent here and this makes it one of the most popular sites in the State. The jetties also make it a premier destination for surfers - which was great entertainment for us fishing on the pier nearby. There are 51 campsites with electric and water. Activities include: picnicking, swimming, surfing, snorkeling/scuba diving, fishing, fishing, fishing. There is even a bait and tackle shop and a concession within the park. Very handy! If you like the beach, this park's for you! Our campsite was located right on the inlet - very scenic. However, in August the biting sand flies were absolutely horrible, driving away many of the tent campers who came in while we were there. Had it not been for our screen room, airconditioned camper and our being away from camp most of the day, fishing in the surfside areas of the park and on the Indian River - we probably would not have stayed as well. My advice. If you are going in the summer - call ahead and ask how the sand flies are. Here's a link to an interesting article about sand flies and a UF experiment to deal with them. Beautiful campsite in Sebastian....but without our screen room, the biting sand flies would have made the trip unbearable. We found ways to stay away from camp during the day to avoid them. 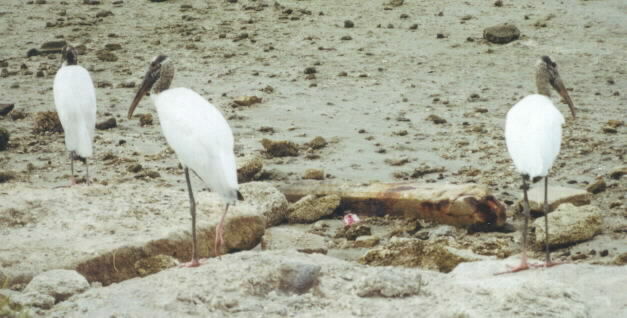 Wood Storks, an endangered species of Florida Birds, gather round Dave with curiosity as he gets fresh seawater for our bait bucket. 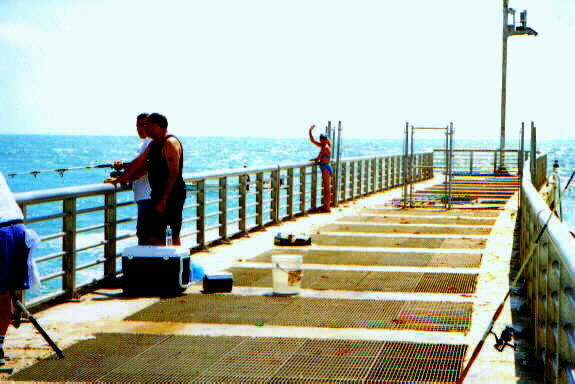 Spanish Mackeral were biting on the Surfside fishing pier. The bugs were not biting - the stiff sea breeze keeping them away. Great place to fish in the early morning, but as the sun rose higher....most folks were seeking shade. Ahhhh. Shade, at last. 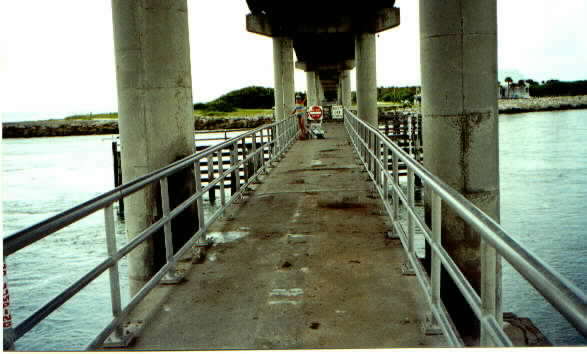 An excellent fishing pier underneath the bridge. It was interesting to watch the tide go in and then out. The current was very swift during the change in tide. Next Day. 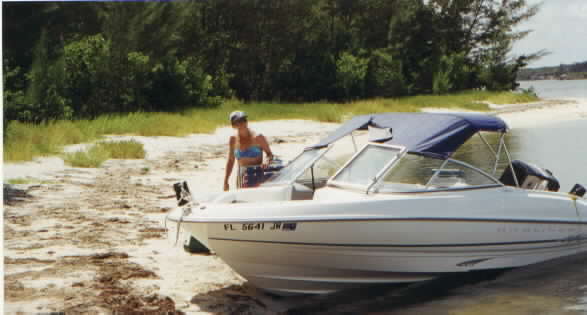 We meet up with my Sis, Cap'n Suz and her boat. Double Trouble, Dave calls this one. Janie & Suzy catching up as we cruise with Suz on the Indian River. No bugs! Away from the Mangrove swamp, it's not a problem. Suzy perfects her bait casting skills with her new net. Fishin' Sisters. The fish weren't biting, but we're having fun! 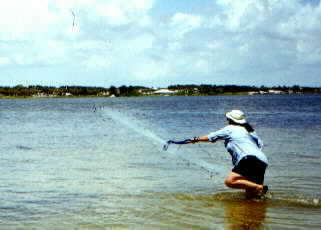 Suzy did catch plenty of bait, though - now a master of her cast net. I'm impressed with the Sis, here! 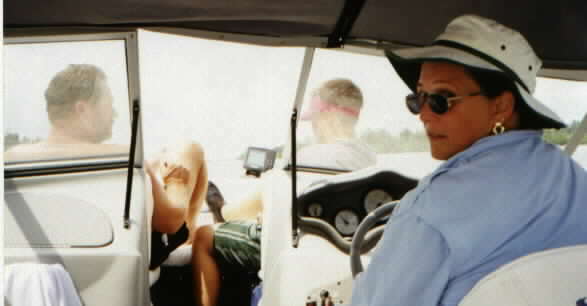 Dave and Marty are "bow riders" as Cap'n Suz navigates us to a neat little swimming spot on the River. She really knows her stuff! She even rescued a sinking boater who was lost on the River that day. As we came in at the boat ramp, we overheard a small commotion from some men with a radio and a buddy somewhere on the River, lost and sinking. Suzy volunteered to help find him and they took off. She found him and towed him to safety. Cap'n Suz is our Heroine of the Day! Curiosity satisfied apparently, the storks mosey back to their group on the beach. First time we've ever been "Human-watched" by birds! 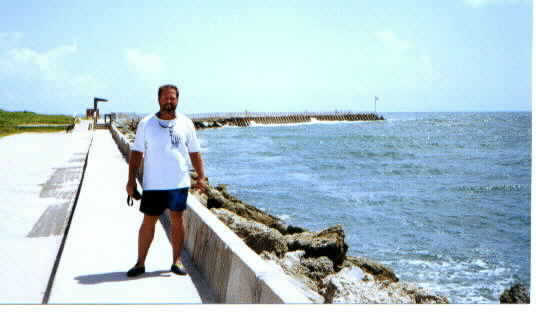 Good view of the jetty that the fishing pier is located on. Good view of Dave, too. 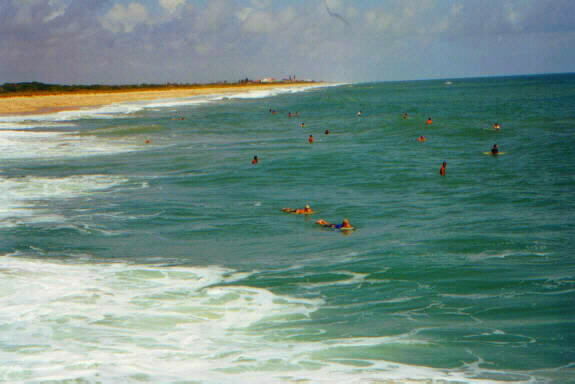 Surfers rule this stretch of the beach located on the north side of the jetty. Even with little to no surf up on this day....they waited for waves, ever hopeful. Surf's UP, finally. Not much, but at least these guys (and gals) did manage to catch a wave or two. 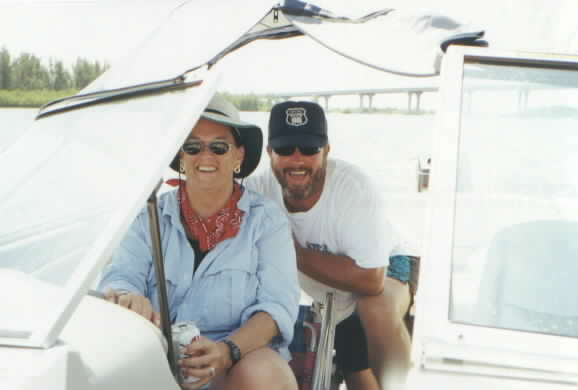 Cap'n Suz and first mate, Dave. She taught Dave how to navigate the Channel markers. Peterson's Island, Suzy calls this. One of many islands located in the middle of the river, we stop here to lunch and fish. 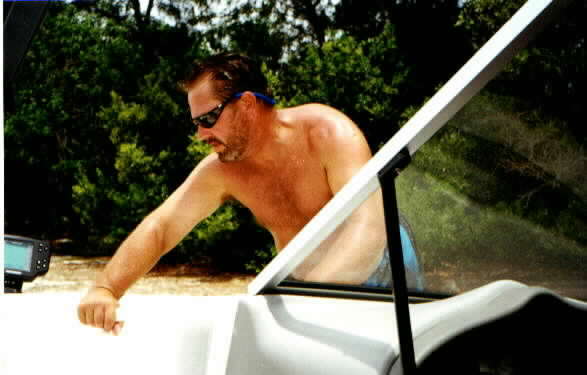 FirstMate, Dave pushing off from Peterson's Isle....it's time to go pick up the nephew, Marty, who's just out of school now. Perfect ending to a beautiful day. 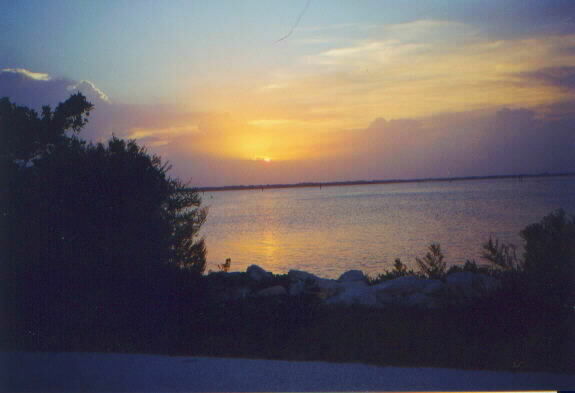 Sunset on the Indian River from our camp.